Twelve Books of Christmas – proof copies to be won. We’re kicking off our series of Christmas treats with proof copies of three books that are set to cause a stir in 2015, sent to me by the very lovely Ben in publicity at Harper Collins, a man who is is really enthusiastic about independent bookselling and the sort of books our customers want to read. 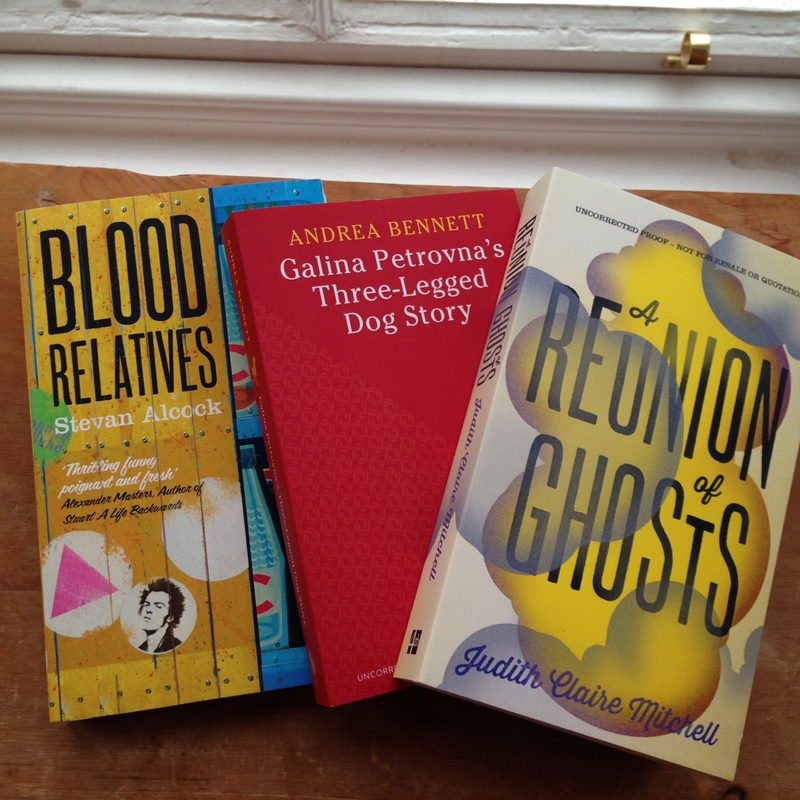 Galina Petrovna’s Three-Legged Dog Story by Andrea Bennett is another debut and sounds a delight which I’m looking forward to reading myself soon. The publisher’s information says: “Perhaps you’re not a member of the Azov House of Culture Elderly Club? Perhaps you missed the talk on the Cabbage Root Fly last week? Galina Petrovna hasn’t missed one since she joined the Club, when she officially became old. But she would much rather be at home with her three-legged dog Boroda. Boroda isn’t ‘hers’ exactly, they belong to each other really, and that’s why she doesn’t wear a collar. And that’s how Mitya The Exterminator got her. And that’s why Vasily Semyonovich was arrested. And Galina had to call on Zoya who had to call on Grigory Mikhailovich. And go to Moscow. Filled to the brim with pickle, misadventure and tears, Galina Petrovna’s Three-Legged Dog Story will leave you smiling at every page.”. It sounds irrestible and it’s out in February. Finally, A Reunion of Ghosts by Judith Claire Mitchell is the third of the three proof copies on offer and is a darkly funny confession of three sisters who have decided to kill themselves. The Alter sisters are the last of a long line of Alters who have taken their own lives. As they gave in the ancestral Upper West Side apartment in New York, another story emerges, of a family carrying a burden stretching back to World War One and a Nobel Prize-winner whose discovery was used for terrible purposes. People who’ve read this novel describe is a literary, profound and also very funny – sounds like a winner to me. It will be published in March, 2013. What you need to do is leave a comment below – don’t worry if it doesn’t appear straightaway, because of the amount of spam I get I manually approve all comments and it might be a few hours until I do that. The draw closes at 11.59pm on 12th December (UK time). More details of terms and conditions can be found on this post and by entering I’ll assume you’ve read and agreed to them. I choose a winner via a random number generator and announce the lucky person on the blog in a couple of days. Don’t forget to check back to see it it’s you. This entry was posted in Reading and tagged 12 Books of Christmas, Andrea Bennett, Judith Claire Mitchell, Proof copies, Stevan Alcock. Bookmark the permalink. These sound interesting particularly A Reunion of Ghosts. I’m looking forward to hearing about what the Fidra plans for 2015 are. This would keep me occupied over the Christmas instead of boring repeats on the telly. A very generous giveaway, thank you. Whoo-hoo! What a cool giveaway! There are never too many books to read! A Reunion of Ghosts seems like it’s one to watch for, all sound great. Happy Hols! I’m completely intrigued by the sound of the Alter sisters. Oh well, it is already the 13th here so I am too late but they sound good so I will keep a watch out for them!